You are able to choose from a variety of models for each American Steel Span metal storage building. The P-Model building utilizes straight sides with a pitched roof and is perfect for a two car garage, backyard workshop or general metal storage building. The S-Model also has straight sides however, the roof is rounded. This type of metal storage building makes an excellent airplane hangar or small manufacturing facility. Farmers seeking a metal storage building will find that it is perfect for livestock protection or equipment storage. Metal storage buildings in the Q-Model configuration resemble a military design that provides superior strength in widths up to 100 feet. 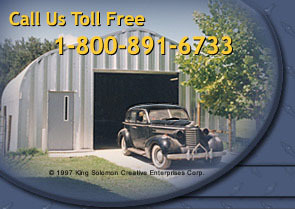 These metal storage buildings are so versatile that they are used for everything from industrial shops and warehousing to skating rinks and have even been used as an indoor softball stadium. An A-Model metal storage building has a 4/12 roof pitch and is ideal in an area where high snow loads are a factor. Garages and workshops function quite well with the walls of this style metal storage building and are available in widths up to 40 feet.